One of the worst victims of climate change, Bangladesh is now seeing an unusual economic opportunity for big farmers in its drought-prone north-western region. But this opportunity comes with a catch, because it may further marginalise around 50,000 poor indigenous people. More frequent droughts and higher temperatures caused by climate change has prompted the landlords in Naogaon district of north-western Bangladesh to abandon paddy cultivation and switch to highly profitable mango cultivation, since that requires less water. That has meant far less work for the landless agricultural labour, mostly from indigenous Santhal, Munda, Oraon and other small ethnic groups, especially in three sub-districts of Naogaon — Porsha, Sapahar and Patnitala. “As the rainfall has come down, the farmers have switched to mango cultivation as that needs high temperature and less water than paddy,” he added. According to the department of agriculture extension, mango was cultivated on 9,146 hectares in 11 sub-districts of Naogaon district in the fiscal year 2013-14. That shot up to 18,527 hectares in 2016-17. Most of this was in the three sub-districts Porsha, Sapahar and Patnitala. “The government promotes mango cultivation in high Barind tracts like Porsha, Sapahar and Patnitala as ground water level has been depleting at an alarming rate,” Azizur Rahman, the additional deputy director of agriculture extension in Naogaon district, told thethirdpole.net. Barind is the local name for relatively arid tracts of land. Bhuttu Pahan, teacher in a local school and president of Jatiya Adivasi Parishad (National Indigenous Council) Sapahar unit, told thethirdpole.net that around 11,000 people from five indigenous groups – Santhal, Munda, Oraon, Barman and Turi – live in Sapahar sub-district. Over 50,000 live in the three sub-districts put together. “Almost all the indigenous people have been dependent on working in the paddy fields of the landlords. Mango cultivation is shrinking the livelihood opportunities of indigenous peoples,” he said. 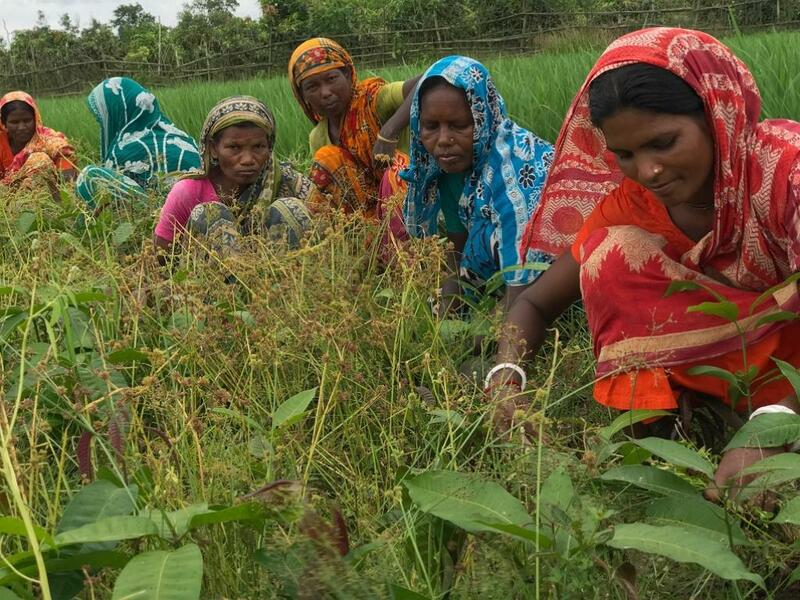 Srikanta Tirkey, a leader of the Adivasi Chhatra Parishad (Indigenous Students Council), told thethirdpole.net that even three years ago, indigenous people could work for one month at a stretch at the beginning of the paddy cultivation season. But now, in many places in Sapahar 50% of the paddy fields had been converted to mango orchards, he said. Two-thirds of the farms in Kuchkurulia village under Goala union in Sapahar are now under mango cultivation. “In Goala union, we used to work in paddy and wheat fields for more than one month. But now, we can work in the rest of the paddy fields for at best 10 to 12 days,” Gangia Bala, a member of the Oraon community and resident of Kuchkurulia, told thethirdpole.net. Mohammed Mokbul Hossain, a 46-year-old farmer living in Kuchkurulia, told thethirdpole.net that he now grows mango in 10 out of the 20 bighas he owns. A bigha is approximately equal to 0.4 acre (1,600 square metres). “Five years ago, I cultivated paddy on the whole land. As big landlords have been earning huge money from mango cultivation, I decided to do the same,” he said. Robi Tigga, a 65-year-old indigenous man who has worked as a farm labourer throughout his life, said that for paddy cultivation, each bigha needs 10 to 12 workers, while a mango orchard of the same size needs at most three. Bhuttu Pahan of the National Indigenous Council – a Munda himself – said that for the last two or three years, landless indigenous people have had to go to the landlords and sell their labour in advance to get rice or money when they had no work. Climate change has effectively turned them into bonded labour. That migration trend is clearer in the next sub-district, Patnitala, from which indigenous Santhals are moving to other districts to look for work as farm labour. Back in Kuchkurulia, Nijoy Tigga – an Oraon – is worried if the 25 families of his community can continue to live where they are living now. “We have been living on this land owned by our landlord since the 1960s. As his paddy field shrink, I do not know whether he will allow us to live on this land,” he said. The shift from paddy to mango cultivation has changed the landscape in many ways. The small copses on the edges of the paddy fields have been cleared in Porsha, Sapahar and Patnitala. The Oraons used to depend on the timber from these copses for Karam Puja (a form of nature worship), held at least twice a year. This is an area where ponds are rare, and residents are dependent on groundwater, the level of which has been falling. Traditional wells are dry, shallow tubewells fail to draw any water. “Even during the rainy season, I used to pump the tubewell a hundred times to fill a 15-litre pitcher. Between November and April, I had to pump double to fill the pitcher,” another resident, Jiti Bala, told thethirdpole.net. “A tumour developed on my hand due to the constant pumping. Now we don’t get water from that tubewell any more.” Almost all the tubewells in Kuchkurulia village were now failing to draw water, she added. “Between 1984 and 1993, we used to get water 22 to 60 feet underground. From 1998, the level started to fall. Now, we do not find water even in tubewells that have been dug till 290 feet,” Luis Soren, a resident of Chanpukur village in Patnitala, told thethirdpole.net. Forty tubewells in the village were now useless, he added. Now, people buy water from the deep tubewells run by a government project called Varendra. In Kuchkurulia, 25 families depend on one tap that is connected to the project’s pipeline. “The Varendra project provides water three times as day. They charge BDT 10 per month for every member of a family,” Basini Bala told thethirdpole.net. “The drought has been cutting into our livelihood. We have been buying water for the last 10 years. The temperature has been going up every year. There is no rain in the rainy season. We do not know what will happen in the coming days,” she sighed.